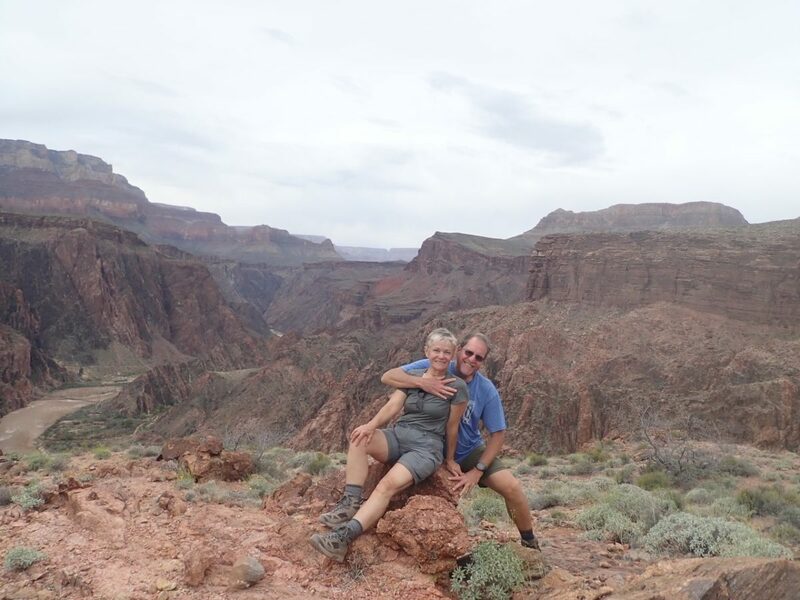 We have visited the Grand Canyon National Park several times – experiencing the vistas from the south rim, north rim and from all of the viewpoints along the way. We have also hiked into the canyon, once staying at Phantom Ranch and a few times hiking “rim to rim” in one day. The last time we did this, we vowed that the next time we would actually bring a tent and stay in the canyon for a few days so that we could really experience it. This past weekend, that’s what we did and it was amazing! In order to camp inside the Grand Canyon National Park, you need to get a permit from the National Park Service, submitting your request 4 months prior to your desired date of departure. It’s not that expensive – a $10 permit fee plus $8 per person per night – but they aren’t always available on exactly the dates or for the locations you want, so you need to be flexible. We hiked down via the South Kaibab trail. This is the shortest way to the river and like all corridor trails, it is very well maintained and has restroom facilities at regular intervals. The vistas are gorgeous; seemingly every turn unfolds another view of the canyon walls. But beware – there is no water on this trail and it is steep. Make sure your boots are good and big so that you don’t lose your toenails! This is not a trail for testing out new hiking boots. 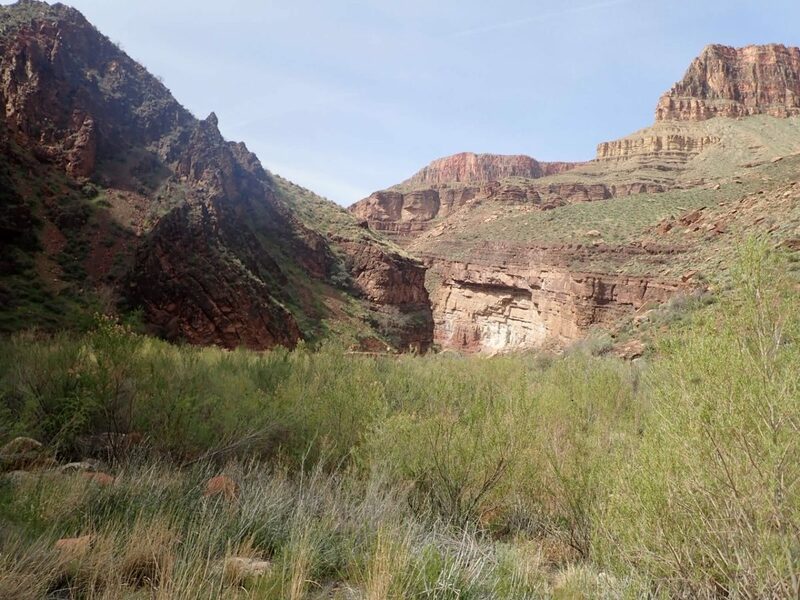 Once you get to the river, the trail takes you across black bridge, past the boat beach to Phantom Ranch – an oasis in the middle of the canyon. Picture huge cottonwood trees, a fast flowing creek and stone buildings dating from the early 1900’s. This area has hosted tourists for over 100 years. Initially Rust’s Camp offered primitive accommodations, mainly for prospectors and hunters. Since there was no way across the river at the time, Rust built a cable tramway over the river. Precarious, but functional! It wasn’t until the 20’s that the Fred Harvey Company hired architect Mary Coulter to design cabins. They wanted to name the hotel Roosevelt’s Chalet, but Mary insisted on the more romantic and mysterious name “Phantom Ranch”. She won! As you hike along the trail, you will notice old telephone lines. These are no longer in use, but a relic of the 30’s when the CCC (Civilian Conservation Corps) installed a trans-canyon telephone line. That was the only source of communication at the time. The CCC also improved the campgrounds and trails, something you can be glad of today! 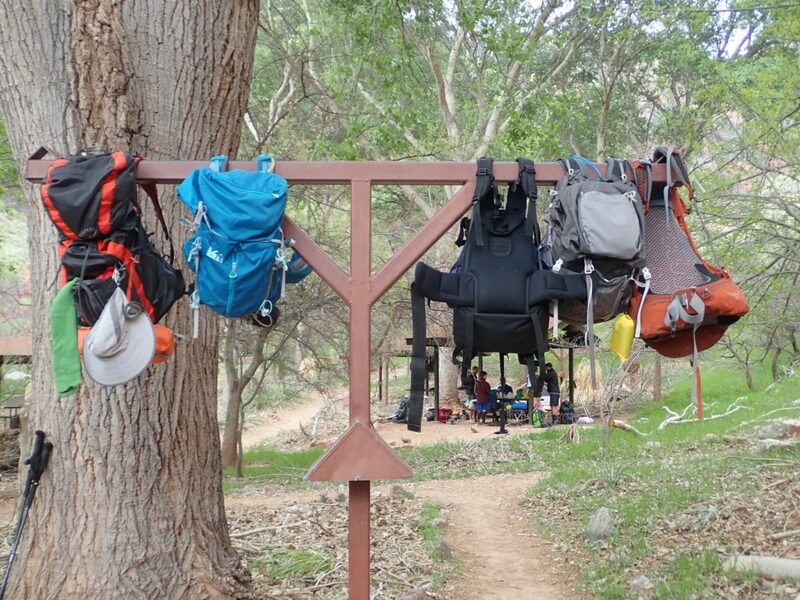 One fun fact… the poles you see for hanging your pack at Bright Angel Campground are actually old recycled telephone poles. 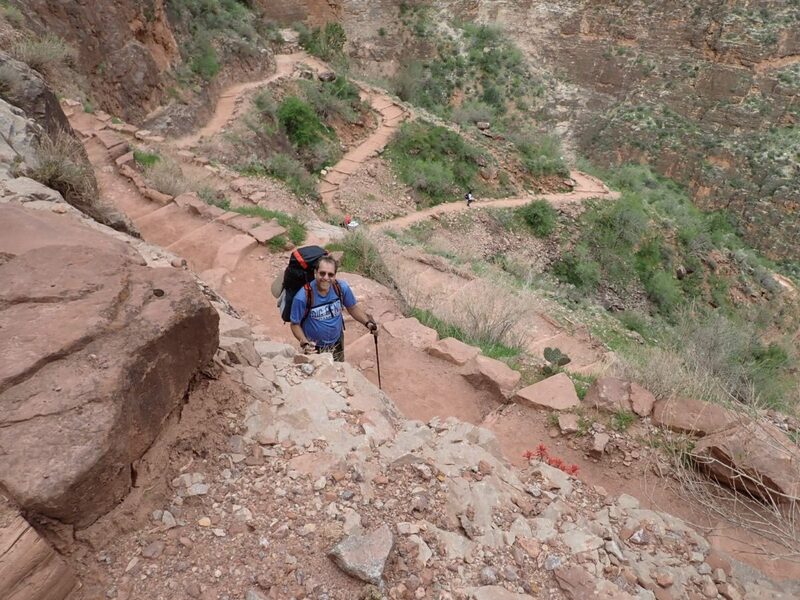 Continuing north from Phantom Ranch, you take the North Kaibab Trail. This trail is totally different. It winds along the Bright Angel Creek, with quaint bridges that take you from one side to the other. Much of this hike is shaded; hiking the corridor between the creek and the canyon walls. 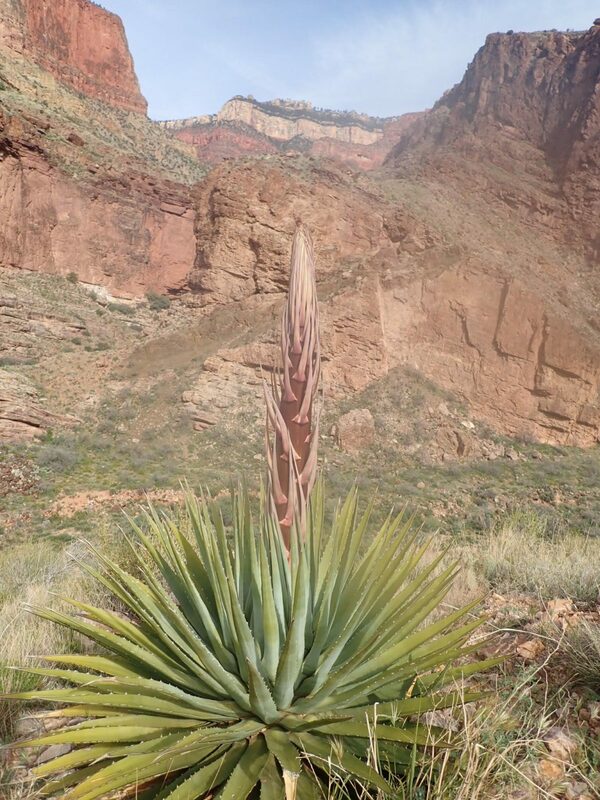 As you get closer to the north rim, the canyon opens up and you hike through high desert with prickly pear cactus, brittle bush and agaves. Everything was in bloom – gorgeous! We stopped at Cottonwood Campground (about 7 miles from Phantom Ranch), but if you proceed, the trail winds it way out of the canyon to finish at the top of the North Rim, over 4000 feet higher. When we were there (first of April), we could still see the snow at the top! Note: the North Rim is only open from May 15 to October 15, but you can get a permit to camp up there off-season. Just be prepared for cold! 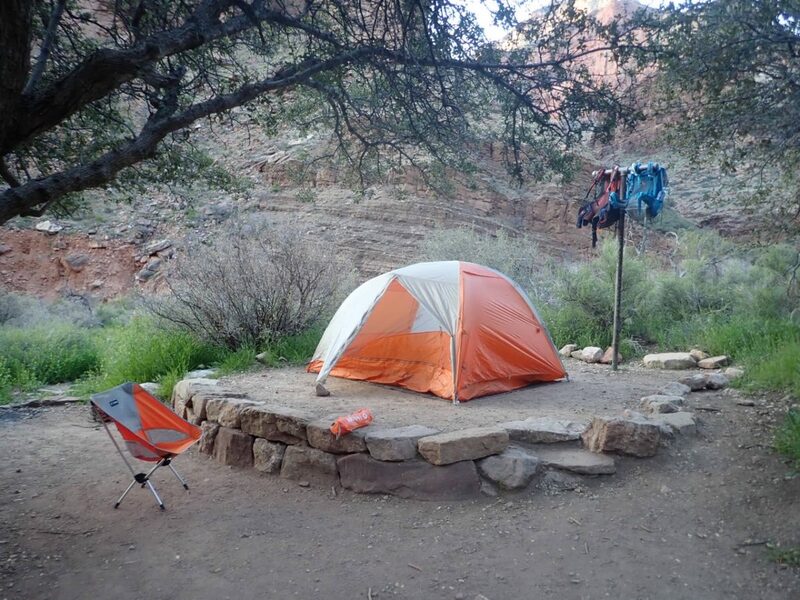 Returning back to Phantom Ranch, we camped our next two nights at Bright Angel Campground. This campground is much more heavily used, with flush toilets and running water. It is a really nice layout … with all of the campsites spread out along Bright Angel Creek, tucked in between the creek and the rock walls in the shade of old cottonwood trees. A truly idyllic location. Be sure to take the time to sit by the creek and listen to the birds. 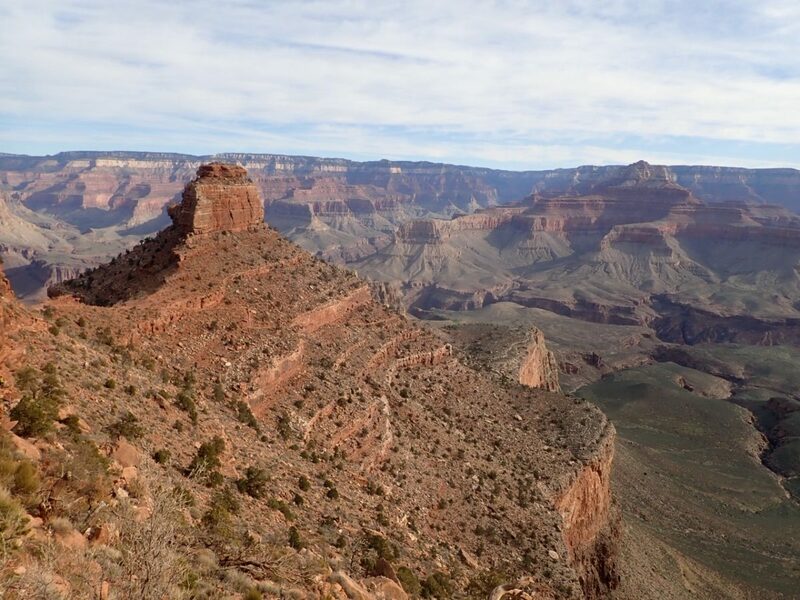 It’s just a short walk from there to the Colorado River where you can look straight up to the south rim and remember – whatever comes down, must go back up! 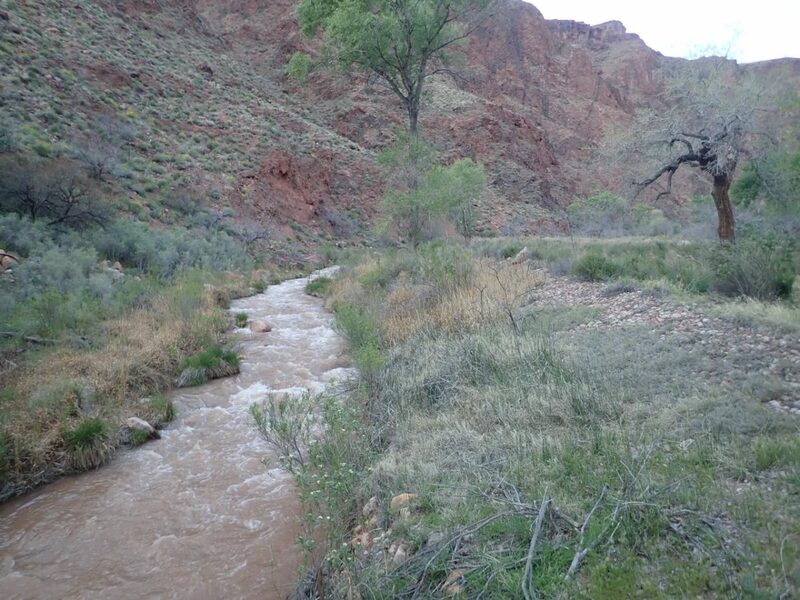 It is also just a short walk back to Phantom Ranch. They sell t-shirts that you can only buy at the bottom of the canyon and they also sell postcards that you can mail by mule. Don’t expect a lot in the way of food – only bars, chips and jerky – unless you reserve a meal in advance. 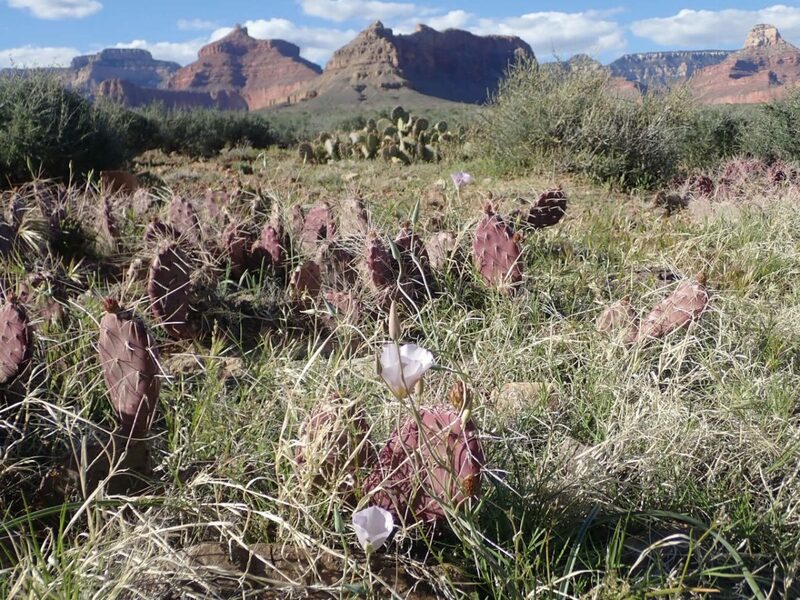 There are a few day hikes from the Phantom Ranch area. We chose to do the Clear Creek Trail. It was a bit of a climb, but the views were incredible. You could see the Colorado River for miles both ways. It was a great view of the inner canyon. As you hike, you can also clearly see the South Kaibab trail as it winds down from Tip-Off to Black Bridge. Wow, that was hike! We only went as far as the upper plateau – a great picnic spot – but the trail goes much farther and there is dispersed camping available. If we go back, we’d probably take an extra day and camp up there if we could get a permit. This is a great place to stop and camp overnight if you don’t want to tackle the climb out of the canyon all in one go. At night you can see the lights twinkling from the hotels at the South Rim and strategize your climb out the next day! 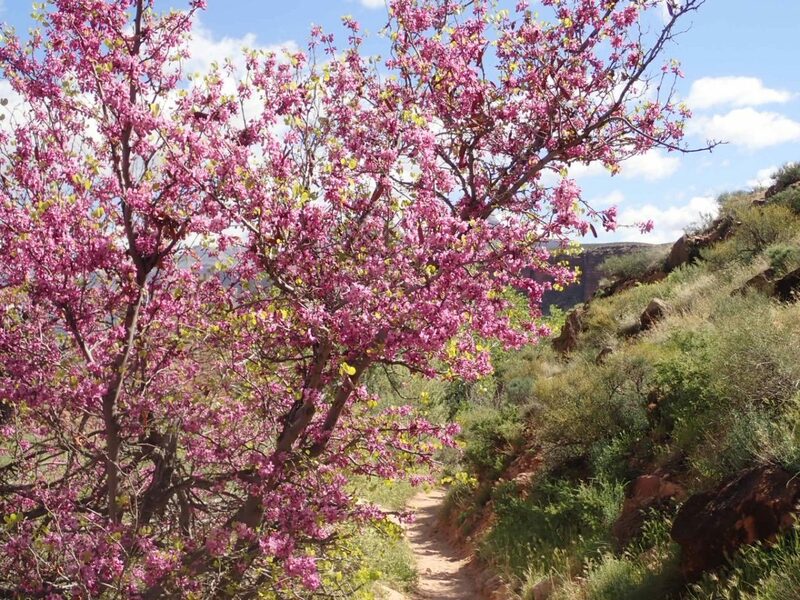 When you are staying here, we recommend taking the 3 mile round trip trail out to Plateau Point. It’s a pretty flat trail out across the plateau (the one you can see when you look down from the top of the South Rim). At the end of the trail you look straight down to the Colorado River and you can see multiple sets of rapids. 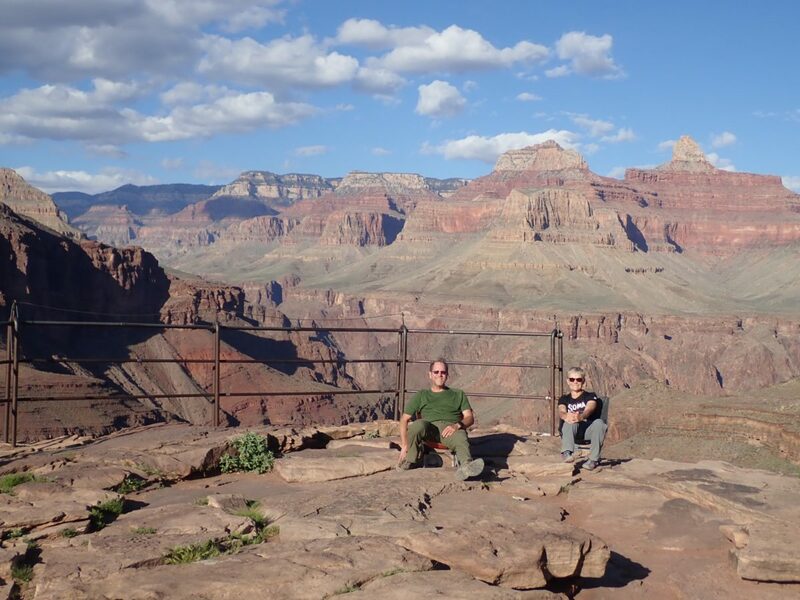 It’s a gorgeous view of the full expanse of the canyon and a great spot to watch the sunset. You might even get lucky and see a California Condor, reintroduced and protected in the Grand Canyon. After a quiet night in Indian Gardens, we headed back up to the South Rim via Bright Angel Trail. It is less than 5 miles back up to the top, but a 4000+ feet ascent. We found it interesting to see the change in the people … as you get closer and closer to the top, there are more day hikers. Many look at you with a backpack and ask how far down you went, then look amazed when you say you’ve been to the river! Beware … after the solace of spending a few days in the inner canyon, it is a rude awakening to see the hoard of people at the south rim. You can expect to see even more visitors at the Grand Canyon this year in celebration of the 100th anniversary of Grand Canyon National Park. Whether you spend a day, or a week; stay in a hotel, ride a mule or backpack; the canyon will never cease to amaze! We hope you can get out this year to visit Grand Canyon National Park and help celebrate it’s 100th anniversary! Amazing! Love the pics and stories, so cool. I hiked out to Plateau Point from the South Rim for my final for “Geology of AZ” at ASU. What a great experience!